And, as I had promised, I will keep you up-to-date on my progress with four projects per post. 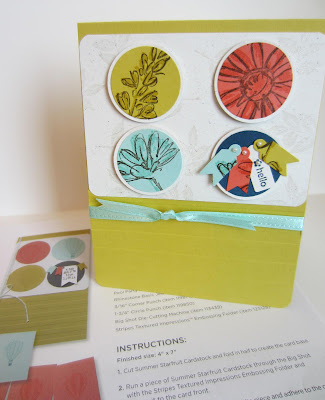 Project 5 called for one of the Stampin' Up! Kraft Gift Boxes (item 124106). Not having these darling boxes in my possession, I decided to make this project into a card. 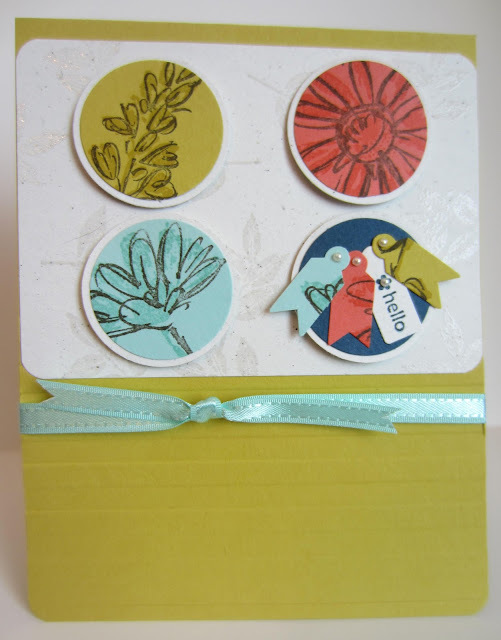 I loved the notion of layering a punched-out space in a piece of colored card stock over Designer Series Paper. I will most assuredly be using this idea again in the future. I must admit that I was not totally enamored of the example shown in Project 6, so I drastically switched it up to become my very own. As you can see by comparing the little project photo in the background, my changes were considerable. The part I like the best about my creation is the corduroy buttons that serve as the center of my black-eyed susans. Retired, of course. But . . . they work perfectly in this card. Since I already had this stamp set out from yesterday's project, I decided to utilize it for my rendition of Project 7. Besides using a different set than called for, I made only a few basic changes in my card. 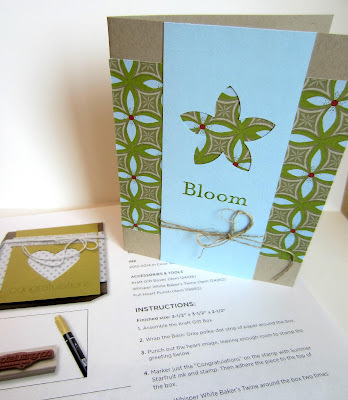 I stayed with Stampin' Up! 's color palette and added a bit more whimsy to my background. Project 8 introduced us to the Stamp-a-ma-jig. As I've said previously, I totally resisted using this little tool for a long time. Until I finally discovered just how indispensable it truly is. I am sad that I do not have the alphabet set called for in these instructions, Morning Post Alphabet (page 144), because isn't it TRULY ADORABLE?? So, I substituted one of my retired alphabet sets, ending up with a more whimsical-looking card. By adding the flowers with Basic Pearl centers atop a Perfect Polka Dots background to mimic the happy pearls, I am very happy with my outcome. So, while you can see that I am remaining a faithful follower of the techniques being taught, by making a few basic -- and sometimes not quite so basic -- changes, I am switching up these little projects to be entirely my own. I am in paper crafting HEAVEN! I already feel so downhearted thinking about when this little online course will end. But, in the meantime, I am enjoying my daily excursions completely! They're really pretty cards. Your additions really look great. As always, love your creations! Thank you for linking up to the In and Out of the Kitchen Link party! I always look forward to seeing what you bring to the party! 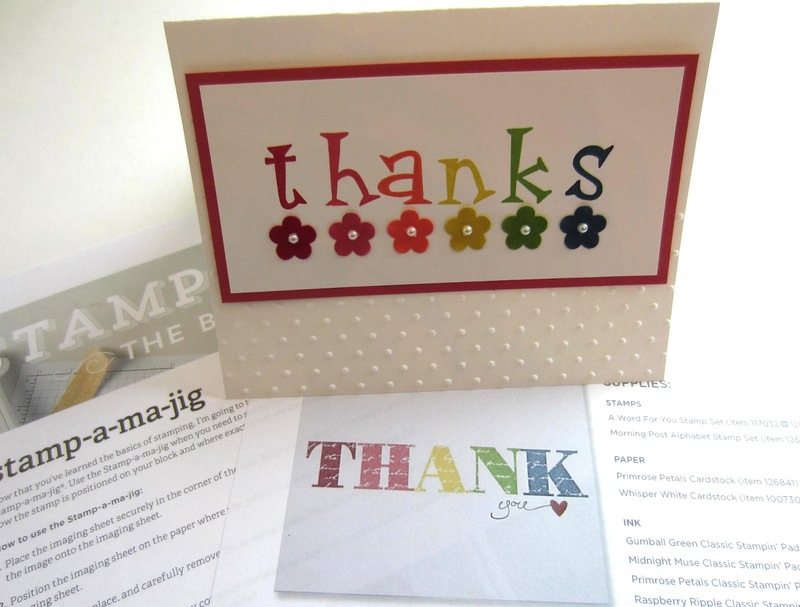 I love those Thank YOU cards..... so cute! Thanks for linking up to Tasteful Tuesdays! love it! Really appreciate you stopping by my blog! I’m trying to keep in better touch with my linkers/readers… If you already follow me, please let me know I will find your blog on Bloglovin (I’m transferring my follows there)if you don’t follow in any way, would you consider following via GFC or other method? What gorgeous cards! How fun to have online classes and inspiration and yet to make them your own. I love the 'thanks' card! So cute! Gorgeous. I haven't made any cards in too long. You've just inspired me. Found you via Dear Creatives. 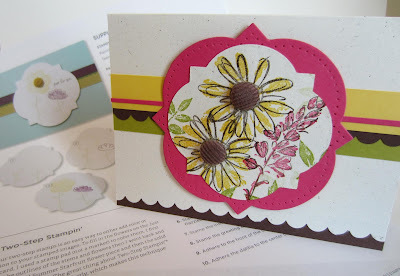 Beautiful cards Linda!!! Thanks for sharing this on The HomeAcre Hop! See you Thursday on the next hop! Boyh my computer and Ipad are mesing up, so I hope I can continue to comment!! 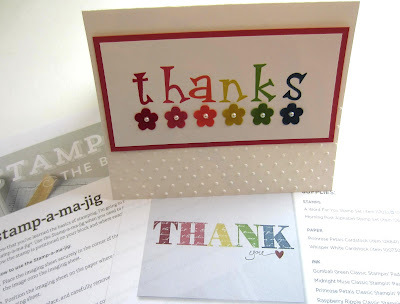 I LOVE your thnks card it is just adorable!! Thank you joining me Linda! Those are very pretty. Thanks for sharing at Pinworthy Projects.